This story was originally published in the March 2017 issue of The Great Outdoors Magazine. I was pleased they kept the whisky reference intact and retained the title! At the end, there’s a link which takes you to the John Muir Trust’s web page about the hydro developments planned in Glen Etive, around which the story is set. Many people had originally made objections to some or all of the schemes on the basis of significant landscape and recreational impact with little or no carbon or energy saving benefit, but two of the schemes with the most objections were recently resubmitted with small changes… meaning of course that the public’s concerns were lost, and now need to be made again if the area is to be protected. To my mind, the area is really significant - the site of a drove road, dozens of ruined shielings, songlines like Duncan Ban MacIntyre’s ‘The Song of the Ewe’ and the much older Deirdre of the Sorrows… and ‘the Robber’s Waterfall’, a place from where bandits would ambush drovers… now one of the very places development is planned. All this indigenous cultural heritage should surely be treasured, but in Scotland we sometimes seem to cringe at our historic riches. It’s still a relevant place. Close to the urban centre of Scotland, accessible and yet with a feeling of remoteness, and valued by everyone from day-trippers wanting a James Bond selfie, to first time family campers, photography tour operators, climbers and kayakers… not just solitude seeking winter mountaineers or the other usual outdoor suspects, but also people who can’t access the high mountains but can and do value the experience of being surrounded by them; a casual stroll, a ‘wild’ swim, an open car door, fresh air and calm. Please make your voice heard before the 6th January, 2019 - the deadline for comments. If you feel strongly about it, I’d appreciate your shares too - either of this article or of your own objections and the deadline, or both. I’ll be submitting my own objections, again, over the Christmas period. Thanks for reading and a have a great break when it comes. Drinking my fill on the Glen Etive Five. I wasn’t expecting to be here, but here I was. 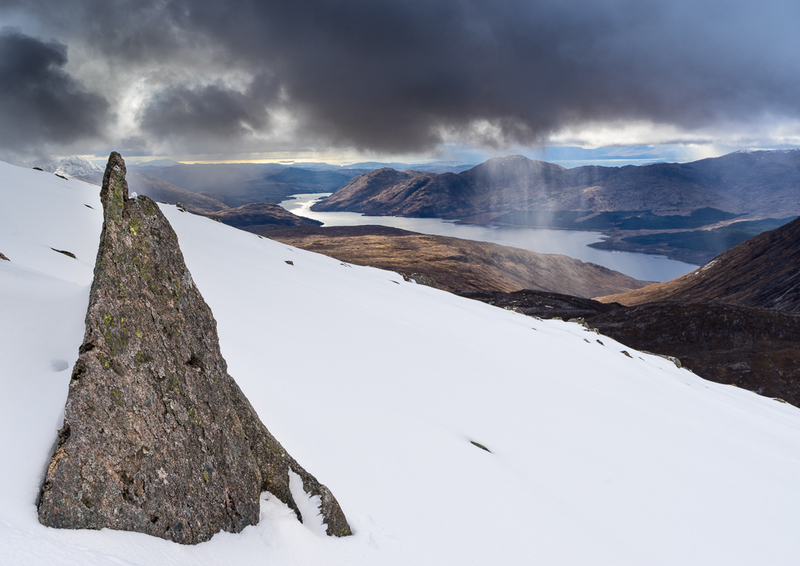 Walking up the north ridge of Ben Starav at 8.30 in the morning, fresh snow underfoot on the 5th day of spring. My other plans hadn’t worked out: The weather window was wrong, I was full of a cold (I have a 2 year old – I’m always full of the cold) and it looked as if winter was over. But as the saying doesn’t go - if life gives u lemons, make gin and tonic. A few day’s before, Storm Katie swept in bringing fresh snow and now, with a brief lull in her wake, I spied an opportunity. Over the past year I’ve been focussed on exploring the mountains closer to home in Glasgow, and Glen Etive is somewhere I keep returning to. 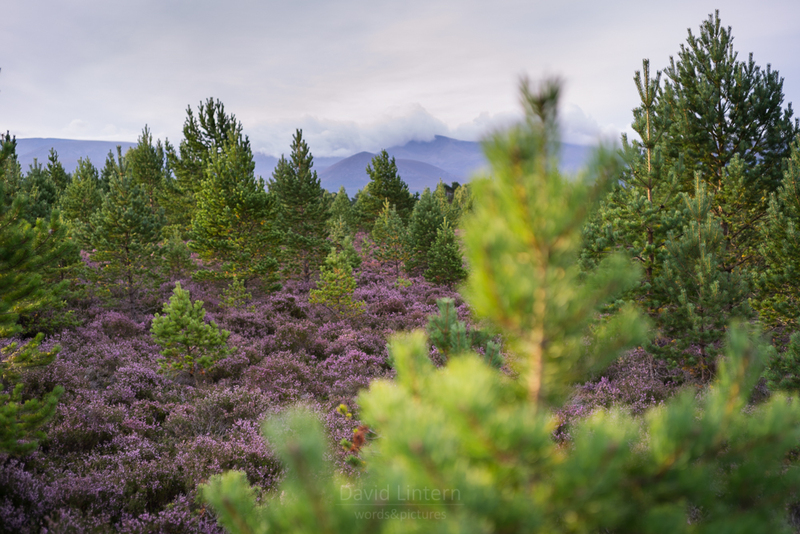 The glen itself could use a good deal less plantation forestry in my view, but it’s still an almost shockingly beautiful place that feels really remote given how close it is to the central belt, and is surrounded by the most incredible mountains. Corbett’s, Munros and a host of unnamed tops… broad ridges, narrow arêtes and deep chasms, wild waterfalls and craggy bealachs, easy walking through to mountaineering and complex climbing routes – there’s something for everyone here, even those who don’t stray from the road at all, and come just for a car camp or a ‘Skyfall’ selfie. We came for the first time with my daughter on her second wild camp in the Autumn, and got to within 100m or so of the top of Ben Starav. The final section of boulders were just too slippery with frost for us to continue safely, and we turned around, still having had a fantastic day on the hill in glorious weather. Ever since then, that hill had been a stone in my pocket. I wanted to come back, and in winter if possible. There’s a group of 5 Munros that adjoin those on the Loch Rannoch side – the Black Mount – but are much easier to access from the head of the Loch Etive. I kept on studying the maps, kept making plans for Nigel, but was convinced I’d missed the season. If that sounds as familiar to you as it is to me, then let me assure you (and myself!) there’s a logic to all our frustrated weekends and missed chances, when the rest of life makes other plans for our time and attention. I guess if there’s a moral to this story it’s that if we keep watching the skies, keep keeping the faith, our number will come up on those outstanding projects in the end. As I climbed on, I became aware that this was one of those times. I’d been granted special dispensation, and the mountain was welcoming me back. There was barely a breath of wind, but still the clouds swelled silently behind me, rising on the thermals down in the glen. All was quiet and still, my only company the sound of laboured breathing and snow giving away gently underfoot. I’d arrived late and plodded up to about 600ms before camping just above the snowline, trusting to the weather forecast and was proven right – there’d been no rustling of tent fabric on the ‘hill of rustling’. I had, however, forgotten how long it took to melt snow for food and water, and was glad I’d brought extra fuel. My half way camp wasn’t the most comfortable – I hadn’t made it to where the ridge flattens out a little - but it did mean a good early start for the hill the following morning, which was valuable. The north ridge of Ben Starav is long - really long. Rising from sea level to nearly 1100 metres, and all in one direction, it seems to go on forever, at least until at least the top is in sight. Shrouded in cloud, veiled then revealed, suddenly the sun alit on bouldered shoulders and I was back in the magic of the present moment, back in the white room with a full heart, my weekly worries dropping irrelevant like a stone into the Loch to my right. I don’t need that weight now, as I plunge the axe into the convex slope a few metres from the summit cairn. As I gently tap the cairn with my axe, I’ve turned a key in a lock. The route takes me in a sweeping south-easterly arc to the sharp ridge leading to Stob Coire Dheirg. On the map this is a minor top en route to my next Munro, but in the flesh there’s an exposed decent to an airy, snaggle toothed spine of rock that joins the two. It’s not technical scrambling, but I’m glad there’s no wind. I stop to stow my other pole and some of my clumsiness along with it, and engage with the rock – axe, crampons, hands, the occasional a`cheval and alpine knee. The weather opens up as I make my way along. I stop for first lunch under the summit and ditch the crampons as a snowshower comes and goes, then slip and slide east, past impressive crags and gullies, down to the bealach under blue skies and a warming sun. Beinn nan Aighenan is more off route than on, but the bealach that joins the ‘hill of the hinds' to the round is, for me, the treat of the trip. A sandy single track cuts through Cairngorm-like pink granite, shot through with ruler straight lines of quartzite, which also lies in seemingly random piles inbetween glacier smoothed bowling balls. The hills grow dark with more snow, but this undulating plain is illuminated with a fiery winter light that gives a lie to the recent equinox. I leave my bag at a prominent rock and set out with axe, camera, sweets and map for the top. It’s another long ascent on slippery fresh snow, with superb views east towards Loch Dochard and the wall of Rannoch, and once on top, the wind bites venomously hard and cold from the Cruachan range to the south. Back at camp on the bealach, I find a burn, and watch the snow showers come and go on the ridges around me. It’s a joy to stop early in this magnificent place, although I am a little concerned for tomorrow. I wake at 2am to stars and again at 7am with a fresh dusting of snow on my pillow. Dawn is of gold and rainbow trout hues, but evaporates as quickly as it arrived to leave cold, clag and a thankless trudge to Munro 3 - Glas Bheinn Mhor, which is exactly as it’s name suggests - 'big greenish-grey hill’, with an emphasis on the grey. A freezing wind blew hard but not hard enough to blow the cloud away. With a compass bearing and careful footsteps I found my exit in the whiteout, convinced that I would bail out at the col below. There seemed little point in the remaining 2, when the weather wasn’t co-operating – surely it was better to come back and do them justice another time? I sat and ate lunch, waiting to see if the weather would improve. I’m a little too good at prevaricating at moments like this. Then, with cloud and hail still billowing over the crest of the ridge, I took one last look at the map, and to my own surprise started up a vague zig zag footpath. I’m not sure what motivated the change of heart, but 15 minutes later I was so glad of it. As I reached the plateau which forms of the bulk of Stob Coir' an Albannaich, the cloud blew through and mountains, boulders and snowfields alike were set alight. Cloud scudded fast across the tops, casting great shadows on the plateau as I slowly postholed my way to the cairn, perched high on a dramatic coire ledge which must be the source of this hill’s name - the 'peak of the coire of the Scotsman'. I leant into the howling wind as I stood on top the shelter stones, resisting the vertigo to soak up the panorama. Our world: So majestic, so surreal and dreamlike. So easy to become inured by everyday life, wonder blunted and run dry, spirit taxed and evaporated by the daily grind… but solo mountain travel is rehydration for the soul. Back in the here and now, getting down looked tricky. I hide behind a boulder and donned crampons, stow my poles and take a few, ginger steps on thin, sketchy ice to the reach the relative safety of deeper snow. Down via the easterly ridge - doing its very best impression of a highland sand dune, sharp light casting deep shadows in it’s lee and snow crystals rattling in flurries along a scissor sharp crest. Then down again, deeply into that Scotman’s coire, another silent, watchful, majestic corner of these Etive hills, to walk between massive Henry Moore erratics perched on ungainly plinths, and static pools of grey water ice, monuments to solitude and the elements. Second lunch and another snow shower, which clears as I begin the steady incline for the final hill - Meall nan Eun – and then descend again for the summit. It’s as if the best of the day’s weather has gone, and the ‘hill of the birds' is cold, undistinguished and barely a top at all, with neither views nor wildlife. I venture to it’s north-westerly end to try and find a way off, but feel sick just looking at the corniced crags to the north, and head back to the gully leading to Coirean Riabhach, with hope of an escape there. Another, longer burst of gloopy, soaking snowflakes, but there… a few lopsided, collapsed footprints mark the way down to the head of a waterlogged coire. For the next hour, I handrailed the burn cutting an ever deepening line into the rock. It sometimes found fault lines and then bands of strength, sometimes spilled over broad terraces and frothed over precipices. Lower down, a deep gorge with silver birch clung to its chiselled sides. Low sunlight spilled in through the gullies from the west, vast javelins of psychedelic orange cast on saturated deergrass – diagonals that grew, changed angle and aspect, traversed slopes before pulling away and evaporating into the fizz of dark grey snow and cloud that now hugged the tops. The glen kept watching me. My pointless internal circles I thought, the glen’s pointed cycles. My noise, its silence; my anxiety, its patience. I walked on - a little further than I wanted - to rest near a ruined shieling, my last night before returning to the city. I’d emerged, recharged by this embarrassment of riches and giddy with the experience of wildness. Drunk on the Angel’s share. It felt like a secret. 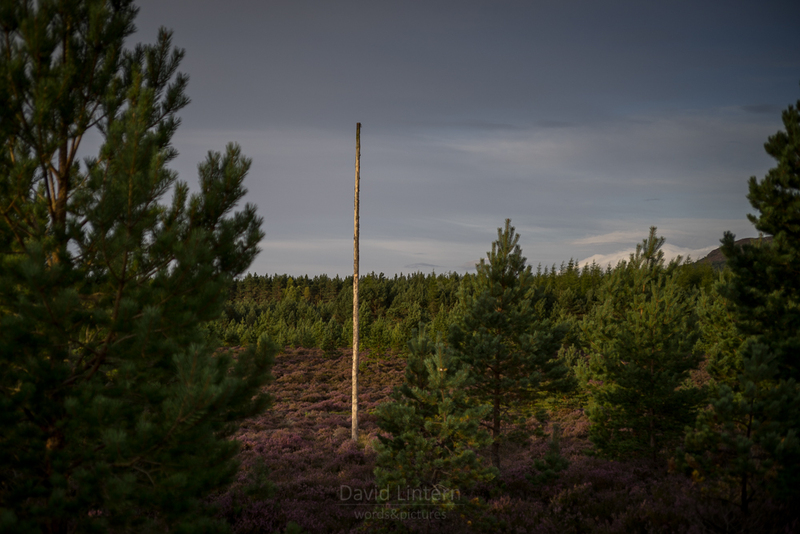 I rarely if ever plug my monthly piece for Walk Highlands on my blog, partly because many more people see my words and pictures there than here, and partly because I assume those who follow my corner of the inter web are probably plumbed into theirs. Who has the time to read these things twice anyway? That said, I'm going to plug away now. 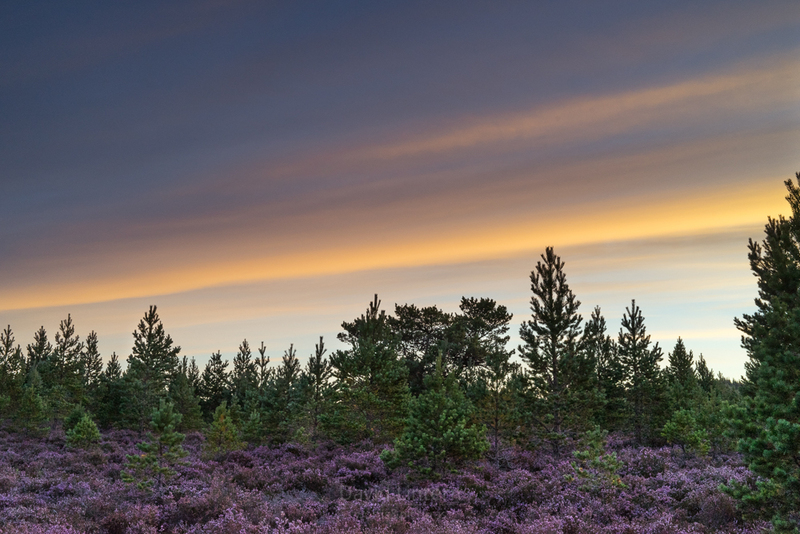 I'd be really grateful if you'd take a look at a piece I wrote about a proposed new town in the Cairngorm National Park. Below are some images of what might well become a building site... and the link to the article is at the foot. What would be even better is that, at the end, you're motivated to take some action on this. Social media is far from being just selfies and bragging. Go witness.